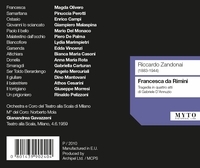 "For the collector who really enjoys this late romantic Italian idiom this performance with the incomparable Magda Olivero and Mario Del Monaco both in terrific voice is highly recommendable - part of the success here is the urgent conducting of Gavazzeni, who clearly believes in the score and who seems inspired by his two leading singers to deliver a performance considerably above the routine. The large-scaled baritone of Malaspina is appropriate for the role of Francesca's deformed and enraged husband. Del Monaco sings in his usual full-throated manner much of the time, but does apply some variety of dynamics and color in the beautiful love duets that are the center of this score. Olivero is a miracle, demonstrating a huge emotional range through the use of dynamic shading and remarkable tonal coloration. She is one of those singers who simply grabs you through the force of her vocal personality and brings you into the heart of the music. The appropriate word is 'thrilling'."